Things are going well around here. Busy, of course but well. So this is going to be a catch up kind of post, a recap if you will of the last week or so. Maddie's nose is fine it doesn't hurt anymore and almost all traces of bruising are gone. Thank you, Lord! 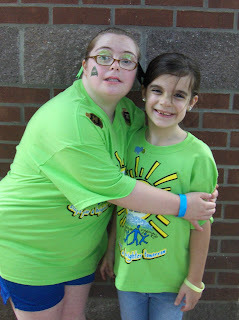 Saturday Maddie and I headed down to Bricktown to the Buddy Walk. 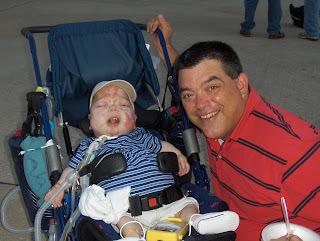 It is held every year and is lots of fun and also full of information on Down Syndrome. 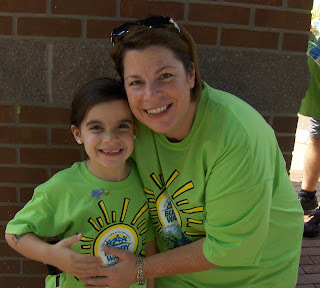 My niece Kylie has DS and she loves the Buddy Walk and we love to support her in anyway we can. 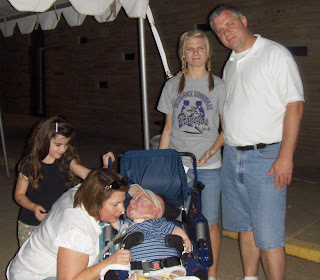 My sisters Kim and Dawn and their families were there as well. 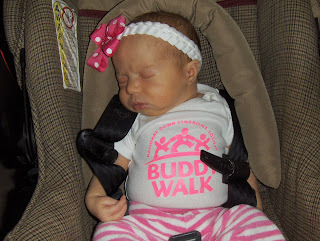 The newest member of our family, sweet baby Kate showed up with her own Buddy Walk shirt made especially for her. So cute. Yesterday I purchased the fabric for the shower curtain I'm having made for this project. I'm so excited about the shower curtain that I'm hoping it will motivate me to get it finished. Because I haven't done one thing to that bathroom since my brother put in the lights. So as soon as I finish I'll post pictures. School continues to go well for both of the girls. Kayleigh's really enjoying high school, she has transitioned well. Kayleigh had a tough blow on Wednesday, her Youth Pastor got another job in another state. She took it really hard. All of the kids were devastated. So, we're happy for Adam and his wife but really sad for us, especially Kayleigh. Maddie was out of school today for conferences. We went to her conference on Monday. She's doing extremely well. I have to brag just a bit, Maddie has 200 site words that she should know by the end of 1st grade, well she know 195 of those words! She amazes her teacher, Mrs. Johnson with her intellect and her personality. On the second day of school Maddie informed her teacher that she was easily distracted. Baahahahaha! One day Mrs. Johnson told her to quit talking and get to work on a paper. Maddie told her that she could just finish it at home. Oh my, Mrs. Johnson has her work cut out for her. The girls are spending the night with their Mimi and Papa so Craig and I are all alone tonight. We're going to eat leftovers and watch a movie. Wow that's exciting. Have a great weekend! Love the pics and I'm so glad your kids are doing well. I think that Maddie and my Cooper would get along really well. Their school personalities seem to be very similiar. Hey Robert and I were alone last night and we were so excited to watch the presidential debate. I folded laundry too. Sad aren't we ;) Have a great weekend.